This movie changed the usual Good Girl Doris Image and brought her the most popular film of her career to that time. She played the life story of 20’s star Ruth Etting, and her co-star was James Cagney, this time in a lead dramatic role. Even today, critics say Doris should have had an Oscar. The soundtrack was the biggest selling album of 1955. “I’ll Never Stop Loving You” was nominated for an Oscar. In 1920's Chicago, Ruth Etting wants to be a renowned singer, which is a far step away from her current work as a taxi dancer. Upon walking into the dance hall and seeing her, Chicago gangster Marty Snyder immediately falls for Ruth, and works toward being her lover, which he believes he can achieve by opening up singing opportunities for her. Ruth is initially wary of Marty, but makes it clear that she is not interested in him in a romantic sense. Regardless, he does help her professionally, and through his opportunities, which are achieved through intimidation and fear, Ruth quickly gains a name as a singer, which she is able to do because of her talent and despite Marty's intimidation tactics. However, the greater her success, the more reliant she becomes on him. This becomes an issue in their relationship as she believes he can take her only so far before he becomes a liability. All well and good, but Marty will never let her go that easily. The one person who tries to get Ruth away from her unhappy life with Marty is Johnny Alderman (Cameron Mitchell), the musical adviser Marty hires for Ruth at the first gig he got for her, and who also loves Ruth himself. 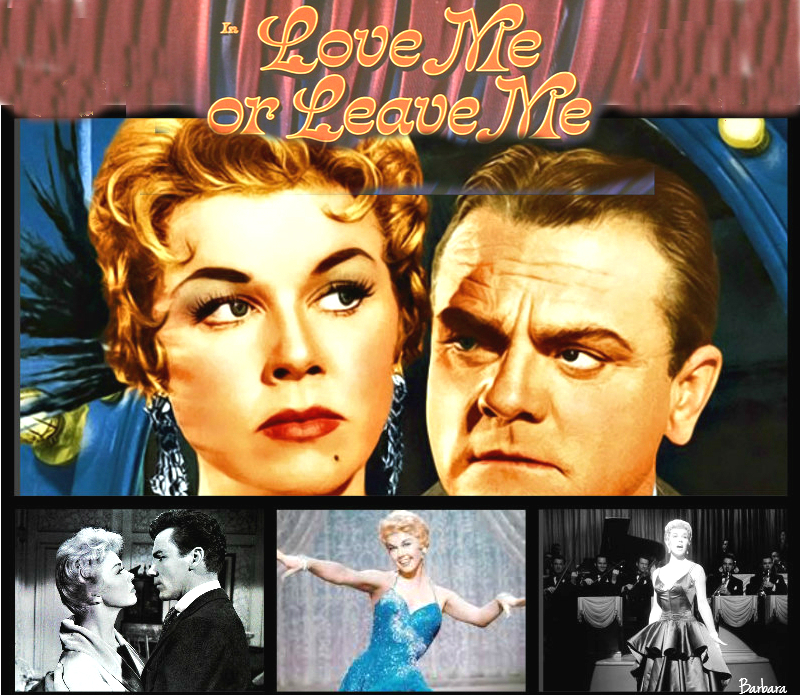 Love Me or Leave Me won the Academy Award for Best Writing, Motion Picture Story, and was nominated for Best Actor in a Leading Role (James Cagney), Best Music, Scoring of a Musical Picture, Best Music, Song (for Nicholas Brodzsky and Sammy Cahn for "I'll Never Stop Loving You"), Best Sound Recording (Wesley C. Miller) and Best Writing, Screenplay. Variety called the film "a rich canvas of the Roaring '20s, with gutsy and excellent performances." Martin Snyder: (to Ruth) Now look here, you stupid liyyle broad, do you know who I am? Do you think I let dames talk to me that way? Martin Snyder: (to Ruth when she visits him in jail) Tell 'em you seen me in the pokey and I looked great! Tell 'em I like it! Makes me feel like a kid again! Ruth Etting: (confrontation with Marty) What's the matter Marty? Are you afraid you're losing your grip? "This was the only time, after becoming a star in the 1930s, that James Cagney ever accepted second billing for a major role. He thought that Doris Day's character was more central to the film's plot, and so ceded top billing to her. " "Jane Russell turned down the opportunity to play Ruth Etting in hopes of landing the role of Lillian Roth in I'll Cry Tomorrow. That role ended up going to Susan Hayward, leaving Russell with neither part. " "According to Doris Day, most of the scene of a violent confrontation between James Cagney (Marty Snyder) and her did not appear in the final film because it would not pass the censors. After Etting is a triumph at the Ziegfeld Follies, Snyder comes to her hotel room to see her, and she tells him to get out of her life. As originally filmed, Cagney slammed her against a wall, savagely tore off her dress, and after a tempestuous struggle, he threw her onto a bed and raped her. " "After this film was released, Doris Day was deluged with mail from fans attacking her, a Christian Scientist, for playing a lewd woman who smoked, drank, and wore scant costumes in the nightclub scenes. Day cared about everyone who was disturbed by her characterization, and she answered every piece of mail, explaining the necessity for realism, and that it was essential to separate actress Doris Day from character Ruth Etting. She felt that as a performer, she had the same responsibility to the public that a politician has to the electorate. " "A fascinating side note to Love Me Or Leave Me is Doris Day's marital situation at the time. Married to entrepreneur Marty Melcher, she had a long and ultimately catastrophic marriage. In her autobiography she cites 'the parallel, in some respects, between [the Gimp] Snyder and Marty Melcher... I hadn't realized at the time how much Ruth Etting and I had in common.' Jim said 'It was as if the picture was a prediction of Doris's own life. Snyder lived vicariously through Etting, as Melcher did through Doris.'" 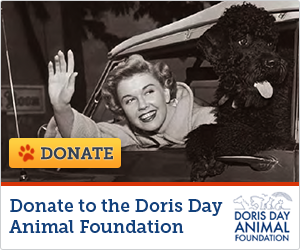 "Doris was paid $150,000 for the film and a guaranteed ten percent of the gross after costs."